Time? The Fresno Food Expo has a business to business portion, as well as a public portion in the evening. *Only open to pre-registered buyers, closed to the public and industry service providers. **Tickets are available for purchase online at www.FresnoFoodExpo.com. Price? Cost ranges from $600 – $950 for exhibitors based upon booth size. Registration deadline is February 15. To register, go to www.FresnoFoodExpo.com. For only $40, the public can come see, taste and discover 110 of the finest food and beverage exhibitors in the San Joaquin Valley. You’ll have the opportunity to come sample peppered salami, apricot-habanero jam, biscotti, Armenian cracker bread, gourmet stuffed olives, a variety of local wines and craft beer, and much more. This is not just a food tasting event, it is an opportunity to discover our thriving food industry and get excited about the amazing food products made right here in the San Joaquin Valley. Tickets are available at www.FresnoFoodExpo.com. Location? The Fresno Food Expo will be held at the Fresno Convention Center, Hall I, 848 M St, Fresno, California 93721. How many growers/operators are participating in the conference? We have room for up to 110 exhibitors ranging from food producers, manufacturers and growers to winemakers and brewers from California’s agriculturally rich San Joaquin Valley. 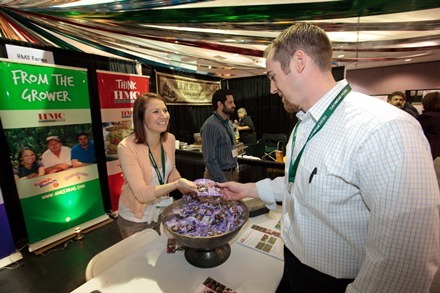 We are expecting roughly 500 qualified buyers from local, regional, national and international retail chains, foodservice distributors, local and California-based restaurants and chefs, large government agencies and hospitality venues – all looking to find quality food products for their customers during the business to business portion of the event. Later that evening, exhibitors can expect anywhere from 700 – 800 people who are looking to get to know the brands produced directly within their own community, increasing brand recognition for those companies among local food enthusiasts and regular shoppers. If you’d like to attend and get to know the companies headquartered right here in the San Joaquin Valley, visit www.FresnoFoodExpo.com for tickets. What kinds of special events or attractions will be provided? During the public portion, attendees will be able to see, taste and discover food products from 110 exhibitors based in the San Joaquin Valley. They will also be able to enjoy cooking demonstrations on the stage, as well as receive a Fresno Food Expo directory with all the information on companies exhibiting, a commemorative bag and a tasting glass. Will there be food and entertainment and if so what kinds of food and entertainment? Tasting from every exhibitor will be provided throughout the day.